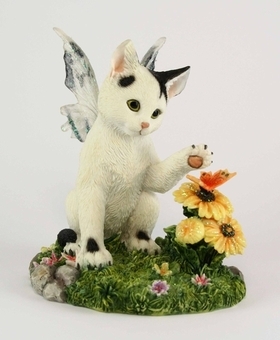 This adorable collectible features a fairy cat! The feline is white with black spots, and has sparkling wings to match, in shades of grey and white. The amber-eyed kitten is reaching for an orange butterfly which sits upon a yellow blossom. More flowers bloom in the grass around the precious kitty. 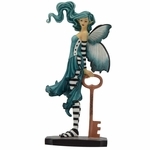 This figurine would look great in the collection of any cat-lover or faery friend!